How Does Rain Affect My Swimming Pool? Rain may look beautiful as it pours across your swimming pool, but the water’s chemistry may be suffering. Rain can have different levels of acidity, depending on where you live, which changes the water’s pH and in turn impacts the total alkalinity and chlorine levels. Here are a few other ways rain can affect your swimming pool, as well as the solutions to fix the problems. 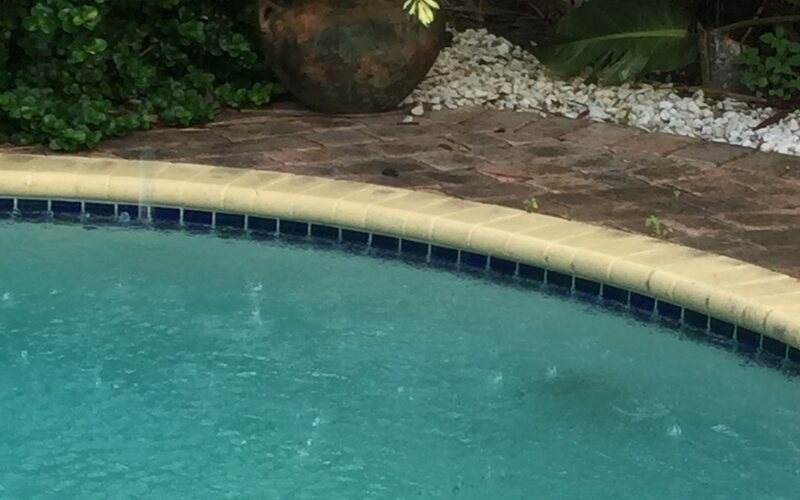 Why Does Rain Change My Pool’s Acidity? The acidity in rainwater is primarily caused by our everyday activities: vehicles and manufacturing, the burning of fossil fuels to generate electricity and oil refineries, to name a few. Rain with higher acidity will cause your pool’s pH level to decrease. The total alkalinity will begin working to keep your pH in balance, then the chlorine in your pool will begin to lose its effectiveness due to working overtime to attack these new pollutants. Especially in Houston, rain is frequent. In fact, Houston actually gets a larger amount of annual rainfall than Seattle! With rain being such a common occurrence, especially during hurricane season, proper pool maintenance is key to keeping your swimming pool in perfect condition. Never drain your pool before a storm as this can be dangerous and damaging. Instead, set your sand filter or D.E. filter valve to the waste position after the rainfall, which will bypass your filter system. If this is not an option, you can use a submersible sump pump to lower the water level or siphon out the extra water. Normal pH levels are between 7.4 to 7.8. If pH is too low, the water may become corrosive. If pH is too high, the chlorine will lose its effectiveness. In most cases after rainfall, you will need a product to increase the pH. Alkalinity increaser will help stabilize the pool’s pH and will also help protect against corrosion and plaster etching. The alkaline range should be between 80-120 ppm. Pool water may become cloudy after rainfall. Add a water clarifier to the pool which will coagulate dirt and oil that may be clouding the water. In addition, add an algaecide to the pool water. This will neutralize any potential algae blooms that were introduced from the rain water. Chlorine levels will decrease quickly while fighting the new contaminants, so you may need to shock the pool after heavy rainfall. You can also do this before a storm. Shocking refers to the process of adding chlorine or non-chlorine chemicals to your pool in order to raise the “free chlorine” level to a point where contaminants and bacteria are destroyed. It is important to run the pump for eight to ten hours in order to distribute the chemicals evenly throughout your pool. Always turn off the circuit breaker that is connected to your pool equipment before an electrical storm. Make sure your pump and timer are turned off. If the storm hits particularly hard, it could cause a gas leak. Turning off gas lines will prevent this from happening. Although proper pool maintenance often stresses the importance of covering your pool, it’s important to not do this during a storm. Not only can high winds rip your pool cover off of your pool, but bad weather can tear or rip your pool cover. It is expensive to replace a pool cover. It’s much easier to prepare the pool before a storm, then clean up after. Shocking your pool before a storm can make cleanup easier. Not only is it important to take care of your pool after rainfall to keep it in good condition for use, but it’s also important when it comes to preserving your Quality of Ownership. Why is this beneficial to you? If you decide to sell your home, buyers want more confidence that they are making a safe, long-term decision that their new pool has been well maintained and documented courtesy of POOLFAX™. You’ll see more blogs soon that elaborate on this critical, yet often overlooked, view of the true value in your pool.